The Luraco iRobotics 7 is a high-end and very popular massage chair. Does the chair’s performance justify the high price and all the praise it gets? This review will give you more information on this and the massage chair’s general features and functionality. The iRobotics 7 massage chair is a premium model that contains numerous and practically revolutionary features. This brand is amongst the few massage chairs that are approved by the UL and FDA in terms of medical use. Therefore the chair is not just a device you can use to unwind and relax after a tiresome and stressful day at work because the iRobotics 7 is just like a highly trained professional masseuse. Luraco is the 1 st and only brand that manufactures massage chairs which are developed, assembled and researched in the USA. The iRobotics 7 is the company’s seventh generation chair. The massage chair is designed using cutting edge technology and it is built to serve the user for up to a minimum of 15 years. The iRobotics 7 model comprises of several incredible features which work together in synergy which in turn creates a very powerful and beneficial user experience. Full Body Heat Therapy – This function is great for loosening sore and aching muscles since it utilizes the heating elements available, which are situated in different areas of the massage chair. There are various heating elements situated in the foot rest, within the seat and the entire back part of the chair. Zero Gravity – Although a lot of massage chairs now include a Zero Gravity function, the iRobotics 7 brands fully utilize this function. The Zero Gravity feature is accessible with a simple press of a button. Operating System – The massage chair has an advanced operating system (OS) which allows you to manage every aspect of your massage with ease, and also the way it is operated. The OS puts together the entire advanced technology. 3D Massage Roller Technology – This function is great for the back and lower neck because its 3D rollers allow easy massage to be performed in the regions where the spine curves. Double Foot Massage Rollers – There are two rollers situated on every footrest. Their main function is to allow easy massages to be performed at the soles of your feet. This function is great for people who are always on their feet. 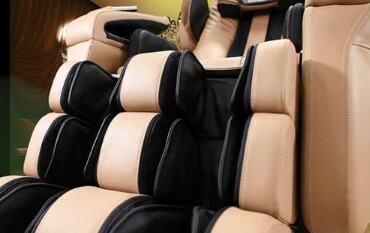 Advanced Air Cell massage – The massage chair comprises of 80 air cells which are distributed everywhere. The air cells are meant to help ease joint and muscle pain and also relax the muscles. Shoulder and Neck Air Cell Massage – This is a type of compression massage that is performed on the neck and shoulder region by a headpiece which is shaped like horseshoes and shoulder bags. 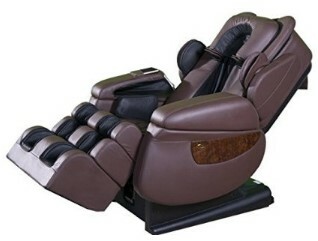 Forearm and Palm Massage – There is one airbag on every side of the massage chair on the forearms. This provides a relaxing massage which in turn improves circulation and at the same time relaxes your muscles. Hand compression is a great way of reliving tension from your hands. Hip Massage – When the hip airbags inflate, they offer a twisting motion which helps to loosen up the muscles in your lower back. Air Cell Massage for Legs and Feet – The air cells in this region softly squeeze the muscles in the feet and legs, thereby reliving tension as well as improving circulation. In addition, the airbags may also grab and hold onto legs which will hold you into place during the massage. Remote Control Technology – This is the first massage to apply this type of technology. The chair comes with a remote control (that looks like a smart phone) and its interphase is a touchscreen. This modern remote control makes it easy to operate the chair. 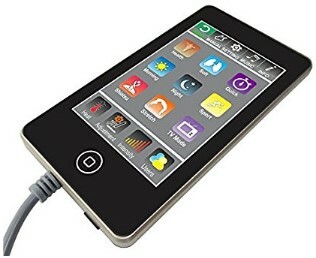 MP3 Music System – You can use the portable smartphone-like remote control to operate the MP3 music system. All you have to do is to insert the SD card and you’re good to go. There are two speakers situated at the back of the chair which is a great additional feature. Health Monitoring Features (Optional) – This being a medical massage chair, this feature is highly recommended. The features function properly and they are great for monitoring your blood pressure and heart rate with accuracy. Aesthetically, this massage chair is a traditional model. Regardless the kind of interior design you have in your home, the chair isn’t flashy and can fit perfectly in your home office or the living room. The chair’s performance is absolutely marvelous. The unit is easy to use, has different adjustable features and a modern remote control making it one of the best massage chairs in the market. Despite the high price range, the iRobotics 7 massage chair has been one of the best-selling products in the market. With a failure rate of less than 1%, a life expectancy of 15+ alongside the fact that it is approved for medical use, you’re guaranteed of a high performing massage chair and at a great monetary value. The massage chair’s high price range is considered to be a major con. However, since it is one of the best units available in the market, the price is justifiable. The only acceptable flaw is probably the low quality speaker which is something most customers don’t customers don’t care much about. The Luraco Technologies iRobotics Medical Massage Chair is a high-quality and medical-grade unit which is easy to operate with a high performance rate alongside a great durability clause. If you’re looking for a massage chair to invest in, this is the perfect choice for you.